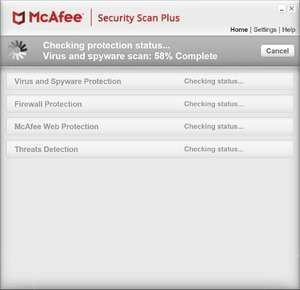 McAfee Security Scan Plus is a freeware and basic malware protection application provided to home users by Intel's McAfee division. The installation of the program is quick and simple and provides a few of the basic protections that will check your system to see whether there is installed antivirus software, a functioning firewall and whether web protection is currently enabled. The tool will also check to see whether the currently installed antivirus and firewall software are up-to-date. Though the application is similar to Windows' own tool to see whether the system is protected, it provides an alternative and also promotes its own McAfee Site Advisor along with promotion of McAfee's own antivirus program. Version 3.11.717.1 is a freeware program which does not have restrictions and it's free so it doesn't cost anything. For security reasons, you should also check out the McAfee Security Scan Plus download at LO4D.com which includes virus and malware tests. Additional screenshots of this application download may be available, too.